The Solstice User Guide provides a summary of how Solstice works for users, including an overview of a Solstice system and steps for users to connect, share, and control content on a Solstice wireless display using laptops, mobile devices, and the display’s user interface. Solstice is compatible with virtually any display and improves meeting room efficiency, engagement, and productivity. Solstice display: Any flat panel or projector display connected via a video cable to a Solstice Pod or Solstice Display Software host PC, allowing users to connect and share content wirelessly to the display. Solstice host: Used to reference a Solstice Pod or Solstice Display Software for Windows. Solstice Pod: Console running an integrated version of the Solstice collaboration software that connects to the display by HDMI video cable. Solstice Display Software for Windows: Solstice Display Software application installed on the Windows 7, 8 or 10 host PC connected to the display by video cable. Solstice user app: Software app installed on user laptops and mobile devices used to connect to and share content on the Solstice display. Posts: The individual pieces of media or content published to the Solstice wireless display. A diagram of a typical Solstice-enabled conference room setup is shown below. The requirements for an operational Solstice system are straightforward. The Solstice Pod or Solstice Windows host PC is directly connected to a display monitor via HDMI cable. The Solstice host is attached to the WiFi/Ethernet network that participants will use to connect and share to the display. Then, users on the network can follow the on-screen instructions to get the Solstice app and connect to the display. Solstice host (i.e. Solstice Pod or Solstice Display Software installed on a Windows PC) that is connected to a room display by HDMI cable. Note: Solstice Display Software for Windows is not supported in a virtual machine (VM) environment or while using terminal services. Solstice user apps that are installed on Windows, MacOS, Android, and iOS devices (such as laptops, tablets and phones) that you want to use to connect and share media to the Solstice display. The Solstice Pod integrates Mersive’s award-winning Solstice collaboration software with a dedicated hardware platform to deliver a turnkey wireless content sharing solution. The Solstice Pod connects to any room display via HDMI and attaches to your WiFi/Ethernet network(s). The Solstice Gen3 Pod supports simultaneous HDMI-in and wireless content sharing, dual displays to support a larger content workspace, PoE+, audio out, and USB-C input for future innovation. For additional specs for the Solstice Gen3 Pod, see the Gen3 Pod Specs. When viewing a Solstice display that does not have a current collaboration session, you will see the Welcome Screen containing the Solstice display name, a screen key (if applicable), network information, user connection instructions, and the Solstice display menu. 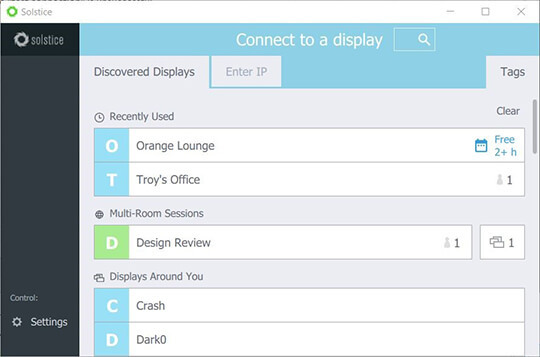 The Solstice Display Menu lets in-room users manually change various Solstice display settings, such as bringing the display out of moderated mode, locking the display, or disconnecting all users. To access the Solstice Display Menu when Solstice is running, click the Solstice icon in the bottom right corner of the display (using a USB mouse or via a supported touch screen). 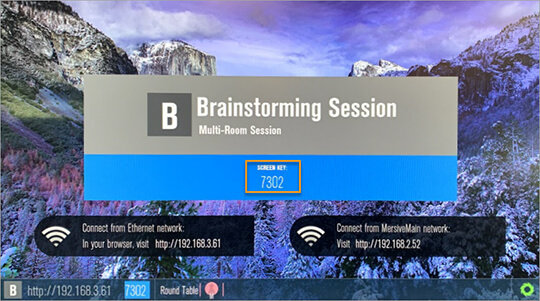 Access Control: Allows a user to manually remove the display from moderator mode in the case that the user moderating the meeting left the room without disconnecting from the display. Note: The display is put into moderator mode through the Solstice user app’s Meeting controls. If moderator mode is disabled for the display, the Moderate tab and option to moderate the meeting will not appear. Lock: Disables access to the display by any new users for the remainder of the session. Only users already connected to the display can share media. Disconnect All Users: Disconnects all users from the session and removes all shared content. System > Configure: Provides access to the local Configuration Panel. This is used by admins to configure settings such as the display’s appearance and network settings. For more detail on these settings, please see the Pod Admin Guide. 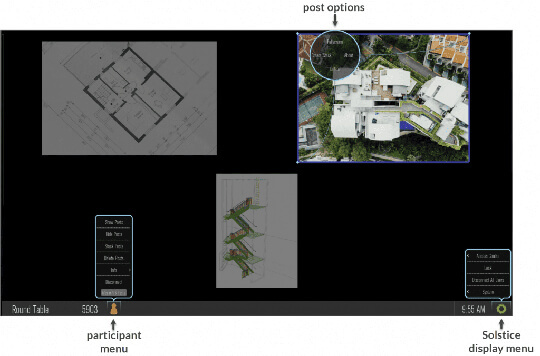 End users can connect to a Solstice display using the Solstice user app. The Solstice user app is installed on Windows, MacOS, Android, and iOS devices (such as laptops, tablets, and phones) that you want to use to connect and share media to the Solstice display. These user devices must be on the same network as the Solstice host in order to connect. First time users that have not previously installed the Solstice user software app have two options: download the user app from the Mersive downloads page, OR, download the app directly from the host. Open a browser on the user device and enter the IP address visible on the Solstice display. The Solstice Quick Connect page opens. If you are on a laptop PC, the user app will download and launch automatically. If you are on an Android or iOS device, the appropriate app marketplace will open and display the user app available for download. Once installed, the app will remain on the device for future use and will not need to be installed again. When you initially open the user app, a list of displays will appear on the Discovered Displays tab that you can connect to. If the Discovered Displays tab does not show any displays to connect to, you can go to the Enter IP tab to manually enter in the IP address shown on the display’s Welcome Screen. Below is an example of the Solstice user app interface. Your Name: How your name will appear in the collaboration session. Notification Settings: Set which notifications you would like to receive: None, Critical, or All notifications. Automatically Share Audio with Desktop: If enabled, your desktop audio will automatically be streamed to the Solstice display when you share your desktop. Hide Solstice When Sharing Desktop: If enabled, the Solstice Client user app will automatically hide when you share your desktop. Automatically Check for Updates: If enabled, your Solstice Client user app will automatically check for software updates. Solstice Discovery Service Address: If your organization has implemented the Solstice Discovery Service (SDS), the SDS IP address is entered here. This is one of the ways that the displays on your organization’s network appear in the Discovered Displays tab. For more information on SDS and the corresponding IP address, contact your IT administrator. Ensure you are connected to a network listed on the display’s Welcome Screen. Open the Solstice user app. If display discovery is enabled, a list of displays will appear on the Discovered Displays tab. Click on a display to connect. Search for a specific display by name in the search bar. Select the Tags tab to filter the list of displays (Enterprise Edition only). If prompted, enter in the screen key listed on the Solstice display. The user app will join the collaboration session with full media posting and control rights. You can share and control content on the Solstice display using the Solstice user app. Guest users are also able to mirror their device screen to the display without needing to download the Solstice user app by using one of two native streaming methods: Miracast (Windows devices) or Apple Airplay (MacOS and iOS devices). Desktop: Share a real-time view of your desktop (Windows or Mac) with an option to share your desktop audio to the display. App Window: Share a real-time view of a single application window open on your Windows or Mac laptop. After selecting this option, hover your cursor over the application window and select. Media File: Share media files such as images and videos. Note: Solstice supports a broad range of video types, but not all video files are supported. If a video file is shared but does not post correctly to the display, you can open and play the video from your desktop, then share your desktop to the display with audio. When sharing your Desktop, if your user app is set to hide when you are sharing your desktop, you can click on the bar that appears at the top of your desktop screen to unhide the user app. You can also click Stop Sharing to quickly stop sharing your desktop. If your organization has enabled streaming with Miracast, users without the Solstice user app can connect and share their screen to the display using Miracast capabilities on their Windows device. Note: If you are unable to Miracast to the display, contact your IT administrator to make sure that Miracast is enabled for the Solstice display. On your Windows laptop, hit the Windows key + P.
In the menu that appears, click Connect to a wireless display. A list of displays appears. Note: If the display is enabled for Miracast but you do not see it in the list of available displays, try scrolling down to ensure it is not hidden. Select the Solstice display. If prompted for a PIN, enter the screen key from the display. Your device will connect wirelessly to the display and your screen will be streamed in real-time. To change how your device handles the display, hit the Windows key + P, then select one of the display options that appear. Mersive recommends using the Duplicate setting when streaming with Miracast. To stop Miracast streaming to the display, hit the Windows key + P, click Connect to a wireless display, then click Disconnect. Mirror Screen: Share a real-time view of your mobile device screen. Media File: Share media files such as images and videos from the device’s media library. Note:Solstice supports a broad range of video types, but not all video files are supported. If a video file is shared but does not post correctly to the display, you can open and play the video on your mobile device and mirror your screen to the display. Camera: Take a picture with your mobile device and share it to the display. Note: Ensure the Solstice app has permission to access your camera. Take Video: Take a video with your mobile device and share it to the display. Note: Ensure the Solstice app has permission to access your camera and microphone. Solstice supports full mirroring of iOS 7+ devices (Apple iPhones and iPads) that feature Apple’s AirPlay® functionality. AirPlay® mirroring is accomplished through the device’s native AirPlay® feature, using a similar process as connecting to an Apple TV. Note: If you are unable to mirror your iOS device using AirPlay®, contact your IT administrator to make sure that AirPlay® mirroring is enabled for the Solstice display. Ensure the iOS device is on the WiFi network used to connect to the Solstice display. Swipe upward from the bottom or downward from the upper-right corner of your screen to open the iOS Control Center. Tap the Screen Mirroring button and select the desired Solstice display from the list that appears. If the desired display does not appear in the AirPlay® menu of your device, open the Solstice app and connect to the desired display, then repeat steps 2 and 3. If prompted, enter the screen key visible on the Solstice display. Your device will connect wirelessly to the display and your screen will be streamed in real-time. To stop mirroring your screen to the display, swipe upward from the bottom or downward from the upper-right corner of your screen to open the iOS Control Center, click the Airplay® button, then click Stop Mirroring. The Solstice Gen3 Pod allows users to connect a laptop PC directly into the Pod using an HDMI cable connected from their laptop to the HDMI-in port on the front of the Pod. This allows users to share a wired content source to the display. The wired desktop sharing will appear in the collaboration session like any other post, and will be able to be controlled by any user in the session that has the Solstice App. On the Layout tab, you have multiple ways that you can control the content and how it appears on the display. Any user connected to the session can control the content layout. Drag and drop posts around to change the order of the content. Drag and drop posts on or off the on-deck panel on the left side of the display. Click and hold, or right-click on a post to view options to make the post full screen, view post details, create a stack, or delete the post. 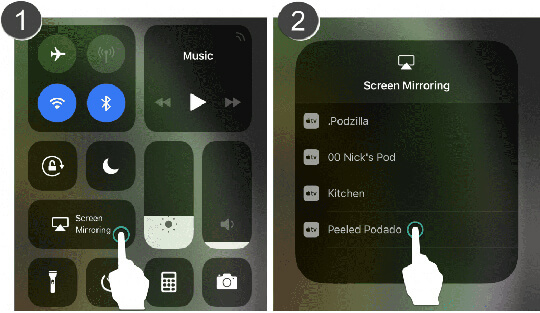 Pinch-to-zoom posts on touch-enabled devices. Control videos posted to the display with the Solstice video player. The Solstice video player functions similarly to other video players, with play/pause buttons, volume control, and loop options. To view the video player controls, click the camera icon in the lower right corner of the video post. Click a Meeple to access the participant menu. This menu gives you options to show, hide, stack, or delete the participant’s posts, as well as disconnect the participant from the collaboration session. Click the vertical ellipsis icon to view the media placement menu. This menu allows you to set whether or not posts are aligned to a grid and allows you to quickly move all posts on or off the screen. Moderator mode allows you to approve requests from collaborators to join the session or post content to the display. Once moderator mode is enabled, any future collaborators will request to join and wait for a session moderator to approve the request. Only the moderator will have the ability to control what content is posted and the layout of the content. Click the Meeting control in the user app sidebar. Toggle Moderate this meeting to “On”. Reject: Connection is rejected. The collaborator will be notified that their connection attempt was canceled by the moderator. Approve: The collaborator will be connected to the display. Approve as Moderator: The collaborator will join with full moderator rights to approve and reject requests to join and post media content. Reject: The post will not appear on the display. Rejecting the request will not alert the user that their post has been rejected. Approve: The post will appear on the display. To control collaborators in the session, click on the meeple group icon in the user panel. A list of the connected users will appear with an option to Disconnect the user or Make Moderator. To exit moderator mode, go to Meeting in the sidebar and toggle Moderate this meeting to “Off”. Available in the mobile version of the Solstice App (for iOS and Android devices), Solstice Ink allows users to highlight and temporarily mark up content on the Solstice display from anywhere in the room by simply pointing and drawing with their smartphones. This feature is also supported in moderator mode. As a note, this feature not supported on tablets. Pointer: Press and hold the Ink button or drag the button to the center of the screen to use your phone as a pointer. Pulse: Tap the Ink button to pulse the pointer. Temporary markup: Drag the Ink button to the center of the screen, then press and hold the button to draw. To exit Ink mode, drag the Ink button down to re-dock it. For participants who are not in the same room as the display, Solstice provides an option to “look in” to the meeting via a web browser. If the Look-In option has been enabled for the display, there are two ways to access it. Note: The Look-In view is not instantaneous and updates every ~5 seconds. Open the Solstice app and connect to a Solstice display. 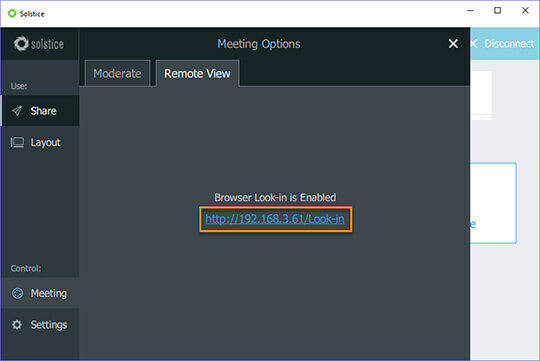 Click Meeting, then go to the Remote View tab. Click the Browser Look-in link provided. A view of the Solstice display opens allowing you to look in to the meeting. Type in and go to the IP address of one of the display’s network options listed in the top-right corner or the bottom-left corner of the Solstice display. The Solstice Quick Connect page opens. In the bottom right-hand corner, click Browser Look-in. A view of the Solstice display opens allowing you to look in to the meeting. 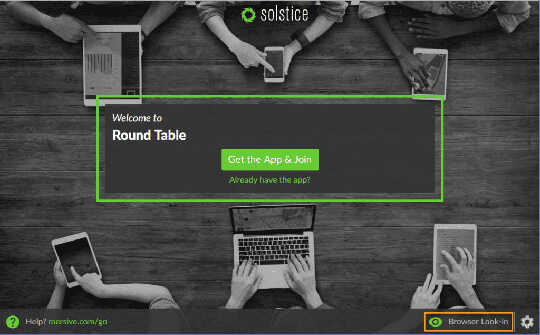 Solstice Multi-Room enables meeting participants to share content collaboratively across multiple locations and geographies on the same enterprise network. 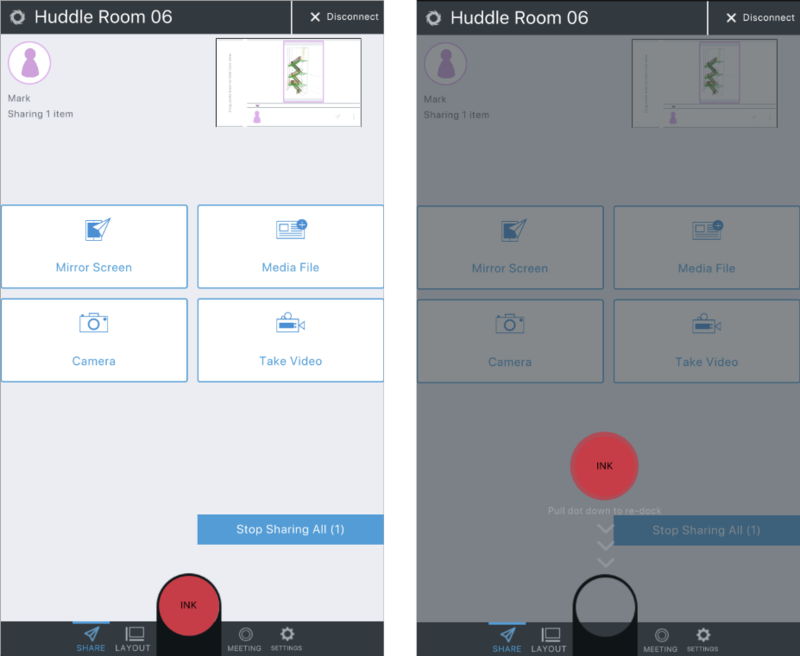 When two or more Solstice Enterprise Edition Pods are synced in a Multi-Room session, shared content will appear on all Solstice displays in the session regardless of which room or location shared the content. In Session Name, enter in the name you would like to give the multi-room session. In the Add an audio bridge field, enter in the audio/video conferencing information you would like to relay to other meeting participants such as a direct phone line, a conference bridge and PIN, or a VTC link. This information will be visible in the Solstice app of meeting participants that have joined the multi-room session (Multi-Room tab/panel). For example, if you want other meeting participants to call in to the meeting, you can enter in the number of the direct phone line in your meeting room. Click Ok. A request is sent to the meeting participants in the multi-room session for approval. Once approved, your display will be connected to the multi-room session. If you have a USB mouse connected to the Pod or host PC, or if you have a touch-screen display, you can interact with the display interface directly to control content. Click and drag posts around on the screen. Click and hold on a post to view options to make the post full screen, view post details, create a stack, or delete the post. Click the Solstice icon to access the Solstice display menu.